In living out this movement, we don’t want to re-create the exploitative intensity of work-rest-work-promotion-crash. We imagine with roots in compassion. Last week, Chelsea presented some key ideas for communal/self-care, and the necessity for sharing practices and building accessible networks of care. 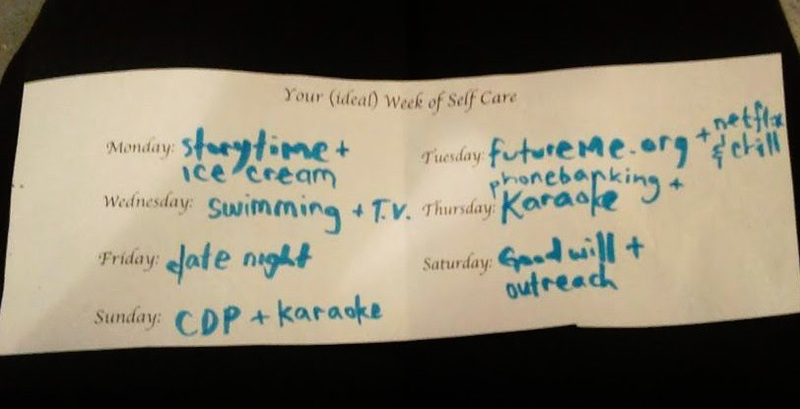 We planned out our week. What’s yours? How can we be a part of your world: personal, activist, spiritual, creative, or anything else? We are getting together tomorrow at OVO Tavern & Eatery at 6 pm to call our supporters to let them know how we can all be a part of the project. Meet us, other supporters, and talk about how we can make things happen for Oakland. RSVP for details. This Sunday, April 17 from 6:30 to 7:30 pm at the Omni Commons, we’ll be tuning in to a different station – learning some basic singing techniques and exercises with the multi-award-winning, talented Victoria. 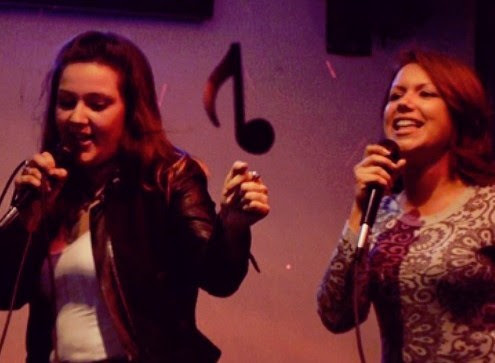 It’s a continuation of our Self-Care series: singing is good for your health! The Community Democracy Project promotes active citizenship, community learning, and direct democracy by putting the people in charge of the budget. Our voter initiative will change the Oakland City Charter so that we the people decide how our tax money is spent. There will be empowered neighborhood assemblies throughout the city where people can come together to discuss community issues and determine public priorities by directly voting on the city budget. Before we re-launch the signature gathering campaign, we have set a goal to first establish a core team of 30 committed volunteers. If you are ready to help make democracy real, join us. Contact us directly for more info. ← Meet Your Neighbors! Signature Gathering, Self Care, Singing Lessons, and more!